My Sami girl was one of a kind! She had a personality all of her own.It was a Sunday morning and I was getting ready to go visit with my baby when the phone rang. When the vet told me she passed on that morning, my heart shattered. I was destroyed and angry at God. How could he take my baby from me. She was only with me for 5 short years. It took me quite some time and I still have a ways to go because Im having a very difficult time accepting it. She left a massive hole in my heart that no one or nothing could ever fill. I cried and cried, I couldn't even function well at all! My family chain wasn't just broken it was shattered! If I see a lump under the blankets I think it's her because she loved to burrow her self in the covers. I have a picture right beside my bed so I can see her when I go to bed and she's the first thing I see when I wake up. I light a candle beside one of her pictures everyday. There are a few people who think I'm crazy but she was more than just a pet, she was my heart and soul. I think that on some days that she's sending me little signs from heaven saying mommy you have got to pull your self together. I opened a new can of coffee and fixed a pot, I went to fix more and I found a piece of her beautiful white hair laying inside the can on top of the coffee. I lost her on Nov.16 2008 due to Addison's disease. I still have her food bowl setting out, I go to bed at night hugging her favorite fuzzy blanket. My family used to feel complete, now all I feel is a broken feeling. I get angry at people around me for smiling and laughing. 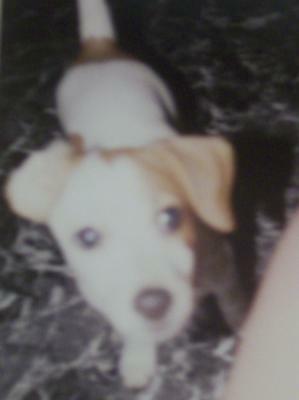 Sami was and still is my angel, she was only with me for 5 short years but left me with a life time full of memories!!! Sami girl, I know that your looking down on mommy and mommy wants you to know that I LOVE YOU with all my heart and that you will always be my ANGEL!!!!! !